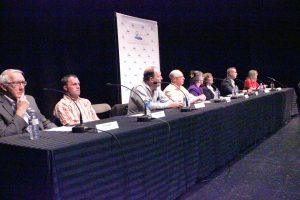 An all candidates forum was held at Creekside Theatre Thursday night, Oct. 4 in Lake Country. Lake Country candidates weigh in on Okanagan Trail, pool and new fire hall. An all candidates forum was hosted by the Lake Country Chamber of Commerce Thursday. Tourism, a new fire hall, the Okanagan Rail Trail, and Pelmewash Parkway were some of the topics Lake Country residents raised with council candidates at Thursday night’s forum at Creekside Theatre. Oyama resident Peter Clarke said he was concerned about water and its future availability, considering Lake Country’s increasing population. “I’d really like to know what (would) happen if I went down to Wood Lake with a tanker truck and picked up water and used it on my lawn. Would that be against regulations to do that?” he said. He said he hoped to bring that question to the candidates before the election. Sandra Steptoe said she was concerned about the intersection at Oyama Road and Pelmewash Parkway and the lack of communication she’s had with the district over time. “There have been decisions made by present council that when I emailed and called they never answered me,” she said. She is hoping for a change in the coming election. Steptoe’s son Justin Neufeld is running to be the next Oyama councillor. Eight candidates attended the forum: incumbents Bill Scarrow, Jeanette Lambert, Penny Gambell, James Baker and new mayoral candidate Barry Rhodes, Neufeld, Carr’s Landing candidate Cara Reed, and Jerremy Kozub, who was acclaimed and now has Winfield’s seat. When mayoral candidates were asked what their two highest priorities for change were, Baker and Rhodes raised the issue of congested traffic at the Highway 97 and Glenmore Road intersection. Baker said it’s the number one priority and that council has been looking for a short-term solution as the ministry looks to the long term. “We’re going to have to convince the provincial government that a short-term fix is necessary because short term could turn into 10 years by the time they do their long-term fix,” he said. Rhodes listed safety concerns at the intersection as well and the need for public safety during a wildfire and having a proper evacuation plan. Carr’s Landing candidates Lambert and Reed gave opposite responses when asked what economic opportunities the rail trail and Pelmewash Parkway have brought to Lake Country. “For years to come, this is going to be a tourist draw for us and I think we’re going to have to work on being able to pay for it right now,” Lambert said, adding there are opportunities for commercial development along the trail. “We need some restaurants so people will stop in when they’re cycling along the bike path.” This will keep residents employed as well as build a tax base, she said. Reed took the opposite approach, saying trail along the waterfront should be preserved and that the district needs to work with businesses to find a balance and develop Lake Country’s brand. “It’s a wonder and we need to support that and we need to maintain that. So I would like to see us keep the areas that are close to the water as clean and as attractive as possible,” she said. All councillor and large and mayoral candidates were for the new fire hall, as Scarrow, Gambell, Baker and Rhodes listed various reasons why there is a need for a new fire hall and why it was chosen on Jardines Road. Scarrow said the district got lucky the day of the Nighthawk Road fire, and said if they hadn’t been so lucky, Rhodes might have lost his home. After touring the fire hall, Rhodes vouched for the new one, saying after comparing fire halls in other jurisdictions, this one’s expense wasn’t that bad. Oyama council candidate Neufeld said the biggest fiscal issue challenge facing the district is keeping costs low for Oyama. A pool question also crept up in the discussions as host with the chamber Kirby Lockart asked if part of Aspen Golf Course could be used for an indoor swimming pool. Lambert said there have been discussions about having a pool located near the arena, to keep amenities central to that area. Reed said a feasibility study is ongoing for the pool. PreviousPrevious post:Thank you Olive Us Oil & Vinegar Tasting RoomNextNext post:Thank you for attending!